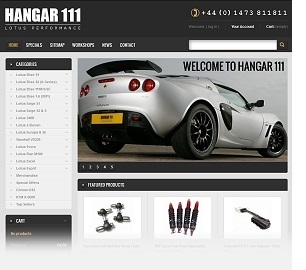 Hangar 111 have a range of uprated parts designed to withstand the extra loads that motorsport can impose on all aspects your car. These parts have been sourced by Hangar 111 from renowned manufacturers and suppliers to the worlds motorsport industry. Our range includes many specifically developed parts for the Elise, Exige, 340R and 2-Eleven. All are ideally suited to competition use. All of these components can be correctly installed and setup at our workshops or purchased through our Online Store. If you are looking to upgrade your Lotus for use in motorsport, whether it is non-competitive track days, sprinting or circuit racing, we can provide friendly advice to help you make the right decisions with the plans you may have for your car. Why not make an appointment and come and see what we can do for your Lotus? You will find alot of these products in our online store, for more specialised requirements please contact us.